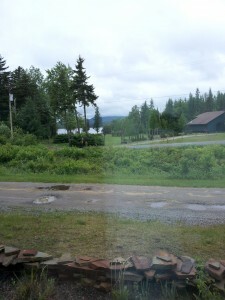 Greetings from the North Country! I started the week off by starting a small survey project. Through every field meeting I’ve participated in, I’ve noticed that growers are always quick to ask about problems with their plants, yet they rarely ever ask about soil health issues. The idea is to go around to a few growers, collect a small sample, and ask them to guess the pH. So far, most growers are incredibly close. Most are only off by 0.2 or 0.3. Though this doesn’t really indicate a larger need for soil health measures to be taken, I noticed that a few newer farmers were unsure what I was talking about. Most of these farmers were fairly new to growing and didn’t come from a scientific background. It’s so strange to me that this summer has gone by so quickly. I’ve learned so much than I ever anticipated. Coming from a background of animal agriculture, I worried about how I would fit into an internship that seemed to focus on horticultural production. However, I found that studying horticulture is just as interesting as animal agriculture to me. I’m extremely excited to continue what I’ve learned this summer with classes back at Cornell in the fall. I feel like I have to thank some people for helping me this summer. First of all, my boss, Amy Ivy, has been amazing at making me feel at home in Clinton and Essex counties as well as teaching me so much about horticulture and entomology. Other thanks to Professor Steve Reiners, who has been available to help me at every step. I would also like to thank Masa Seto for allowing me to help him with his research of the leek moth (and for the hike through AuSable Chasm!). Finally, I want to thank everyone at the Clinton County Cornell Cooperative Extension office for being so welcoming and kind! One of the most educational experiences of this internship takes shape through field visits from Cornell faculty. 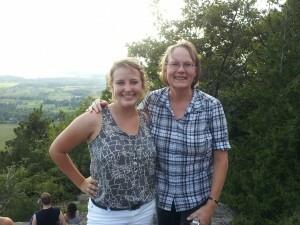 By bringing in a different person each week, Amy Ivy (executive director for the Clinton County office of Cornell Cooperative Extension – and my boss!) has made expert knowledge accessible to the members of the North Country. 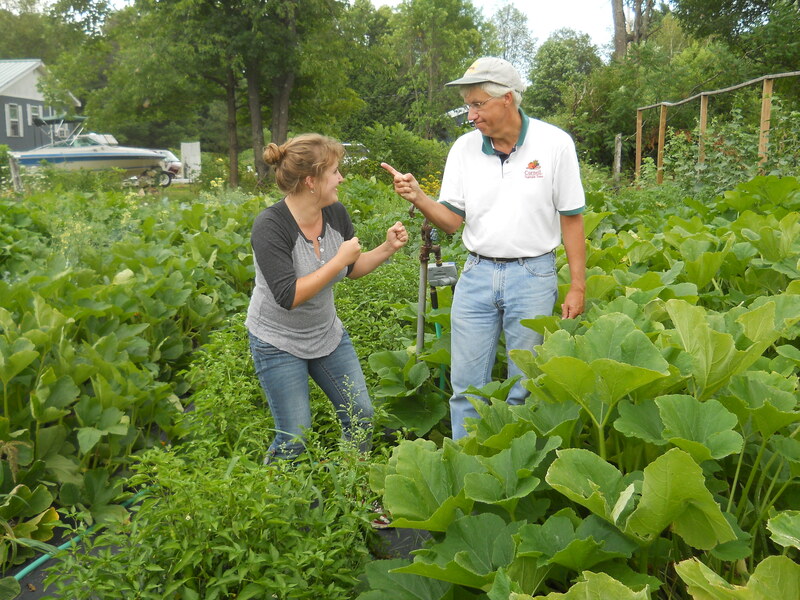 The idea is that by performing local farm visits as well as hosting a field meeting, the farmers and growers are able to ask specific questions about specific problems instead of being forced to search through Cornell databases for help. The informal atmosphere also helps to foster collaborations among farmers in the same region. Last week, Jud Reid came in and hosted a field meeting at The Carriage House. Being an expert on vegetables and insect management allowed him to pass on advice to local farmers about nitrogen management during periods of heat stress. We stopped by multiple farms and growers. One that we lingered at for awhile was Campbell’s Greenhouse in Saranac, NY. 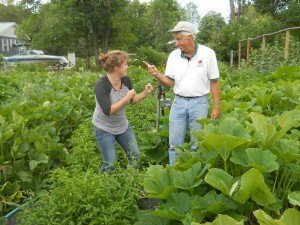 Here, Jud gave advice to the owner about proper care for high tunnel tomatoes. The two discussed the proper suckering techniques. At another farm, Jud taught me easy identification of problems in plants. 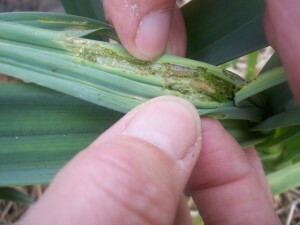 For example, yellowing of the tissue between veins on leaves of a crop can indicate a magnesium deficiency. 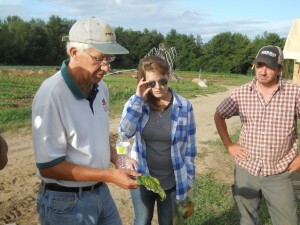 At the end of his visit, The Carriage House hosted a field meeting that gathered multiple growers. One interesting aspect I learned from this tour was about how one grower was doing a study through a grant from the USDA that required he grow the same crops in two adjacent plots: one inside a hoophouse, the other outdoors. The one outdoors was more susceptible to threats such as pest infestations and weather disasters, while the other faced more problems with heat stress. This week, Professor Stephen Reiners and his graduate student, Sarah Hulick, visited from Monday to Wednesday. On Tuesday, we spent the day visiting different farms and talking about issues at each. At each place, I was able to learn about something new. While attempting to identify a cover crop of grass at one farm, Sarah was able to teach me techniques to identify grasses (which should come in handy in my Field Crops class during the fall semester!!) such as looking for oracles. At another farm, Professor Reiners showed me an example of the blossom end rot for the first time and explained how it occurs due to a calcium deficiency (as well as other factors) and can be treated by applying appropriate moisture. These field meetings have been a great experience because it perpetuates a discussion that will benefit all parties in the long run. 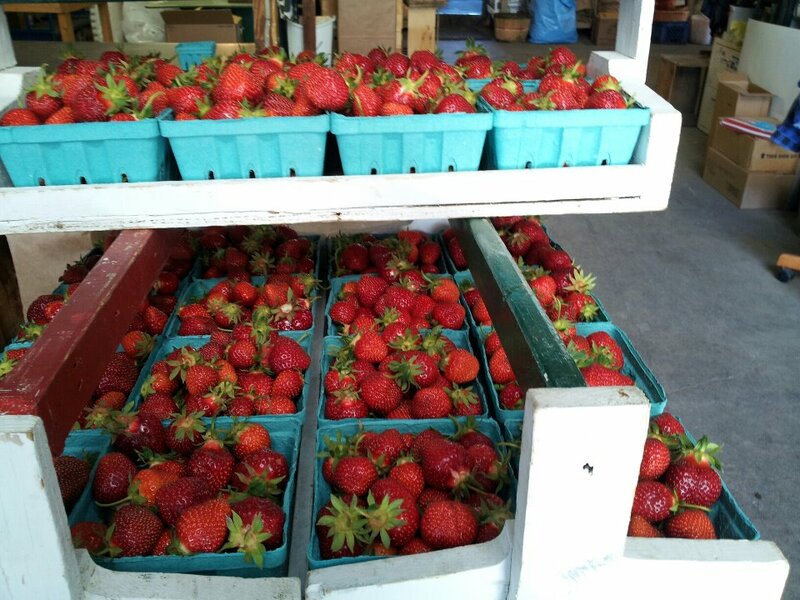 Though you may think that growers would hold back due to fear of competition in the marketplace, that has not been my experience in Clinton and Essex counties. Growers have been very open and willing to talk about their strengths and their witnesses. At each field meeting, you can always spot a few growers chatting amongst themselves about which pesticides each is using, whether or not to use row covers, etc. Also, it really is fun to goof off with your faculty advisor. Greetings from the North Country! It’s been a hectic few weeks. It’s almost time for the Clinton County Fair, which means the entire office is buzzing with excitement. From making to posters and registering 4-H kids to making changes to the actual grounds, there are so many things to do. I have volunteered to judge both 4-H projects as well as the Swine show. This will be an interesting change of pace, considering I have participated in swine shows myself for the past seven years but have never judged one before. The Willsboro Research Farm hosted a Farm Tour on Tuesday to show what they do. Having visited and met with the staff of the farm, I already knew how hard they all worked, but this tour was still an eye-opener for me. 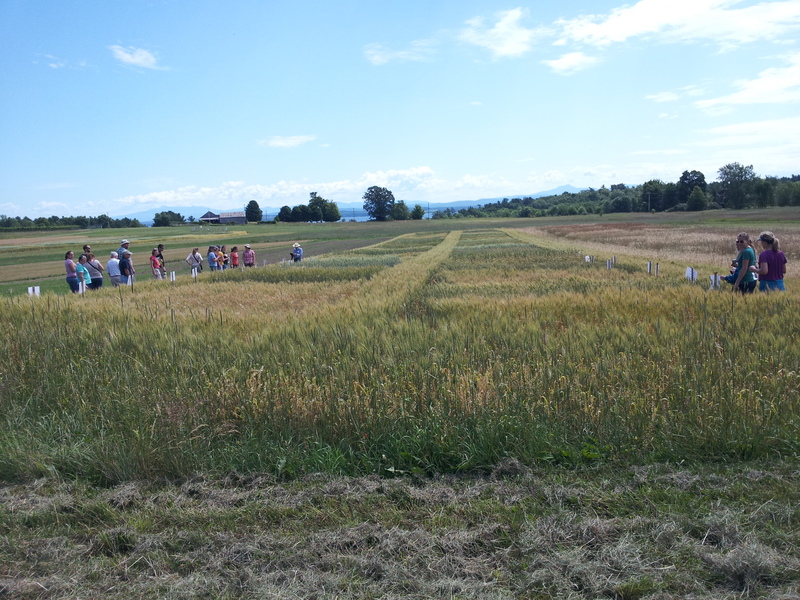 They conduct multiple wheat and grass trials, as well as grape, corn, tomato and even more than I could name. They also hosted a session with a local baker who discussed why he valued using local products. As a baker, he told us how it is the most important thing to create a quality product as opposed to creating an optimally efficient set-up. Overall, it was incredible to see the connections made through this research farm. 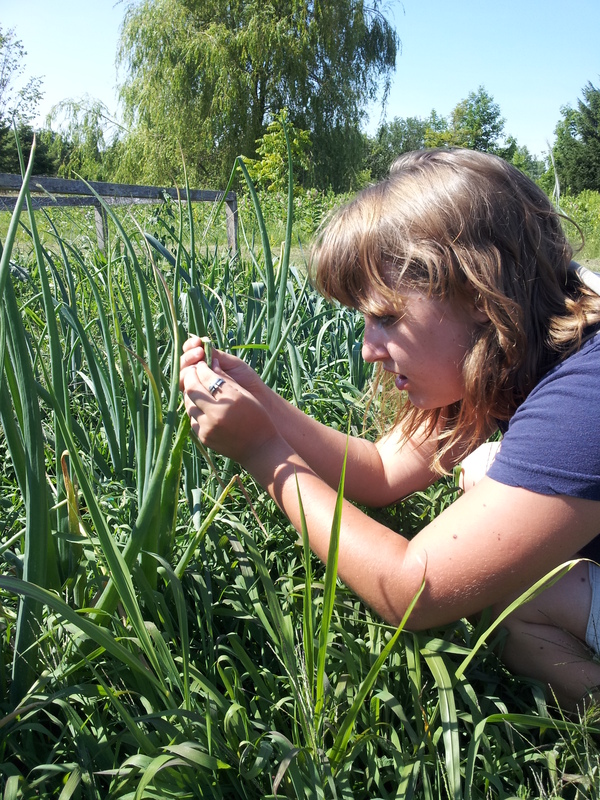 For the duration of the leek moth project, I have been working under the guidance of Masa Seto, a researcher working at the New York State Agricultural Experiment Station in Geneva, New York. The experiment breaks down into seven sites with pheromone trappers and data loggers which record the daily temperature and light intensity. These are set up near plots of onions, which were planted to specifically lure in the pest. Our preliminary findings show that the leek moth seems to be moving south, as it was confirmed in Willsboro, NY for the first time this year. We spent a day together travelling to each site and meeting with the farmers. We even experienced a stroke of luck – one home gardener knew of a neighbor who had complained of problems with her onions. We ended up visiting her and confirming that she also had the pest. 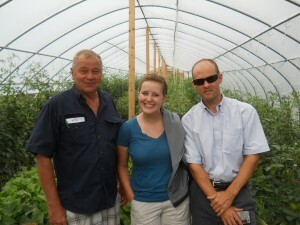 Our office also organized a field meeting with Abby Seamen, the New York State IPM Coordinator. 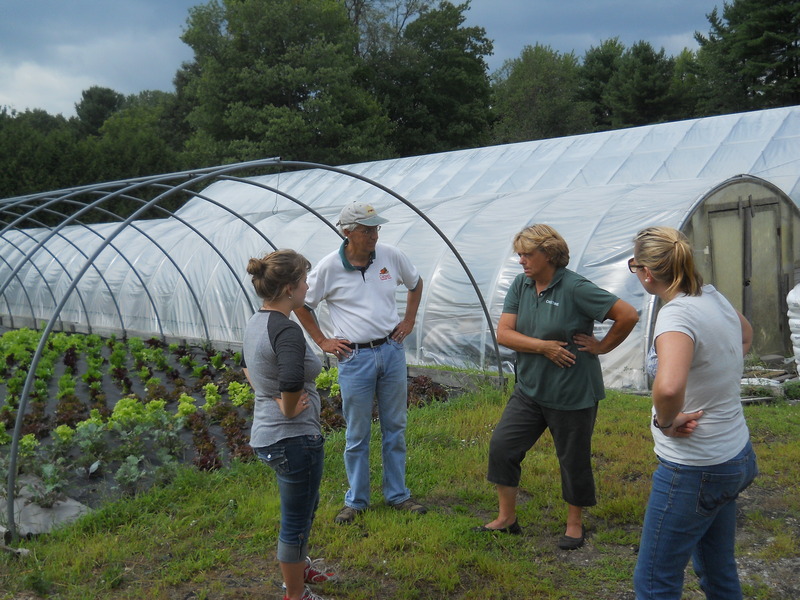 Seven local farmers met up at the Juniper Hill farm to get advice straight from an expert. Concerns were brought up about leaf hoppers, cucurbit pests and corn pests. It was really great to see farmers put competition aside and simply share their ideas with one another. Considering that these farmers are competing with each other in the marketplace, it was reassuring to see a collaboration to achieve the greatest possible yield. Abby also left behind handouts of color photos of pests in case the farmers had any questions in the future. For me, these past few weeks have given the fairest representations of what it means to work in extension. As the intern, I realize that I bounce back and forth between departments, but this enabled me to see just how much is going on in this office at any given moment. Our Nutrition Educators share their recipe ideas with me as they prepare for a program to encourage students to live healthier lifestyles. Our 4-H agent tells me about the progress of planning a county fair. Our horticultural agent shows me downy mildew for the first time. 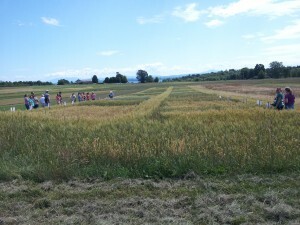 The collaborating researcher tells me about how he got into research and what role extension plays in connecting the work in the lab to the farmer in the field. Though this internship is definitely hard work, it sure isn’t boring.